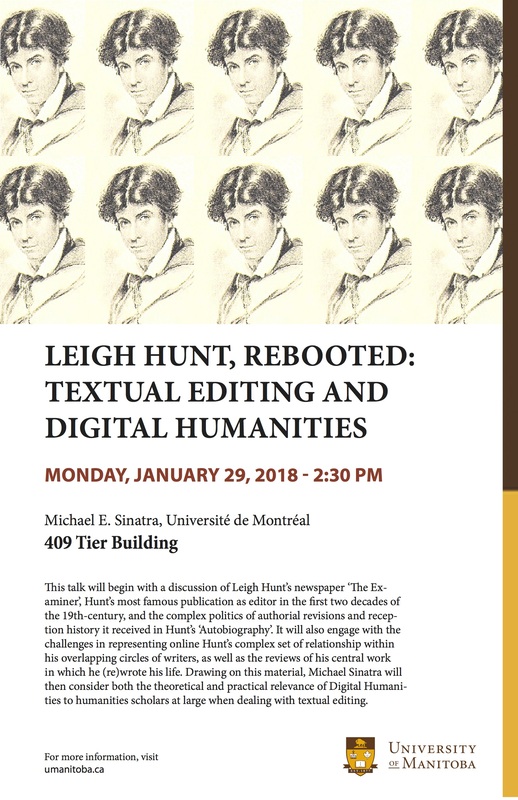 This talk will begin with a discussion of Leigh Hunt’s newspaper The Examiner, Hunt’s most famous publication as editor in the frst two decades of the 19th-century, and the complex politics of authorial revisions and reception history it received in Hunt’s ‘Autobiography’. It will also engage with the challenges in representing online Hunt’s complex set of relationship within his overlapping circles of writers, as well as the reviews of his central work in which he (re)wrote his life. Drawing on this material, I will then consider both the theoretical and practical relevance of Digital Humanities to humanities scholars at large when dealing with textual editing. This content has been updated on January 20, 2018 at 20 h 08 min.